Did you sepnd a litte too much time bent over your computer today? How about working in the yard? Chances are, no matter what you did, you are feeling the effects of fetus-itis. Yeah, I just made that up, but it describes the rolling forward of the shoulders, the dropping of the chin and the rounding of the spine forward into a fetal like position though less exaggerated. If you feel like your body is all kinked up in this fashion, try this simple stretch to un-kink your body and get immediate relief. First get a round bolster like the one in the picutre or tightly roll up a towel. Lay the towl on a flat firm surface (not a bed) and sit with the prop perpendicular to your body and paralell with your spine (as you lay back). Slowly lay back on the bolster along your spine keeping your knees bent. The support should go all of the way to your head so that your neck remains neutral. Rest your arms away from your body in a "T" with your palms up. You will immediately feel the stretch in your chest and low back. As you rest in this position, your body will relax into the prop and into the floor creating traction on the spine. Hold this position for 1-2 minutes for beginners, 3-5 minutes once your body is familiar with the stretch. After, gently roll off of the prop and back to the floor allowing your spine to slowly return to the neutral postion. As you rest for a minute, or so, you will feel your low back release. Roll to your side and push yourself up when finished. You should immediately feel your head pulling up, your shoulders pulling back and your low back stiffness subsided. As with all stretches, listen to your body. If there is pain, you either have to adjust your form or perhaps the stretch isn't what your body needs. Hey good stretch for sure! 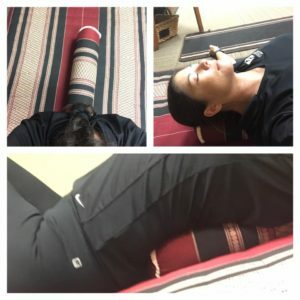 I love my 2.0 grid foam roller! I use it when I don’t have time for a massage! Thankyou for sharing! ?